As a mom of 3 boys that love to color, draw & paint I always hated to give them paint or anything that would make a mess or stain . Well now I am worry free with the Crayola Magic Light Brush . The unique clear gel paint only reveals its bright, bold colors when brushed onto Color Wonder paper. This allows young artists to create works of art without the mess that typically comes with painting. That means moms can breathe easy and join in the painting fun, or take advantage of the time their little artist is occupied with a mess-free activity.Because Color Wonder is mess free, kids can take their Magic Light Brush anywhere and enjoy painting anytime. The Color Wonder Magic Light Brush features a 6-ct. strip of Color Wonder gel paints in classic colors: red, orange,yellow, green, blue and purple. The light up fiber-optic paint brush is tethered to the unit so it will never get lost. When not is use, the paint brush snaps securely into place, as do the paints, for convenient storage. Color Wonder Paper is specially coated so color only appears where it should. Color Wonder products are clear, and their colors only appear on Color Wonder Paper. Color won't appear on skin, walls, carpet or clothing. See the Magic Light Brush in action ! 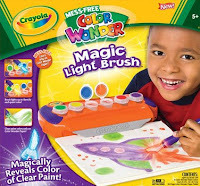 Win A Crayola Magic Light Brush ! Visit Crayola, then leave a comment letting me know which other product you like. I really like the glow station. other than the basic crayons (who can go wrong with those) the glow set has also been on the wish list at our house! I like the crayola beginnings scribble and sing. Another product I like is the sidewalk paint sprayer. The GLOW STATION looks like a LOT of fun! as well as the color explosion Glow Board! 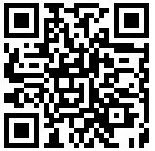 i also am subscribed via email! we have the glow station, it is awesome. The Glow Station looks like lots of fun. Thanks for the giveaway. The Crayola Glow Station looks like lots of fun. Crayola makes the greatest products. Thanks so much. I think the Color Explosion Glow Board would be fun for my daughter or my grandson. Thanks. I also like the glow station. I totally love the Scribble and Sing Art Station! We love the idea of the glow station. I'm old school - there's nothing like a new big box of 64 crayons. The Scribble and Sing Art Station would be alot of fun for Liz and Tristan. I like the Glow Station. I tweeted and I follow you on Twitter. I like the 3D Sidewalk Chalk. Such a neat idea. The Crayola Beginnings Scribble & Sing looks adorable. I have a new grandson, so this will be great for him soon! Thanks! I like the Crayola TaDoodles scribble and sing art center. Thank you! My favorite is the 150 ct. Telescoping Crayon Tower. I would have loved one of these as a kid. I am so impressed by ALL of the Crayola products. When I was a child there were crayons in different sizes and different size boxs. That was basically all I ever saw or owned, the fat ones when you were small, the thin ones with incredible arrays of color when you were older. I love the ones that children can write on the bathroom tub with and so on. I like the color wonder sprayer. i like the crayola glow station really neat! Crayola just makes some wonderful products. The Glow Station has caught my attention right now. I love the Glow Station. It looks like fun. I think the glow station would be fun for Gracie. She loves all arts and crafts items. The Glow Station would be fun as well. THank you! I would love to get my youngest grandaughter the TaDoodles™ Scribble And Sing™ Art Station. The washable paints are most interesting to me. Thankfully my little one is a little too young for painting. I'm not sure who would like the light paint more, me or him. Thanks for the giveaway! The glow station would be fun. I love the sidewalk paint sprayer. My kids would have a blast with this. Immediately I clicked Crayola WASHABLE. Can you tell I'm a mom? Even with all the fancier products and toys, I still love Crayola's washable markers best. Here's a set we don't have: "12 ct. Crayola Doodling Fine Line Washable Markers." Fine-line markers would be handy for a lot of "art treasures" we're bound to create one of these days. I'm an email subscriber, which is how I discovered this Crayola giveaway. My favorite are the Disney Giant Coloring Pages. Thanks for the giveaway! I like the Scribble and Sing! The Sidewalk Paint Sprayer looks like loads of fun. Crayola modeling clay. I spent many, many childhood hours creating little critters out of clay. Thank you for the great give-away. The Color Wonder Sprayer looks fun too! And I have your button up. I like the Glow Station, which is really cool. I like the Squeezable Washable Bold 3-D Paint. Looks like it be fun to use. I think the Tadoodles Scribble and Sing is really cute. Thanks for the great giveaway. I like the Disney Color Catcher Painting Kit! I also love the TaDoodles Scribble And Sing Art Station for my youngest son. the Glow Station looks like tons of fun!!! My son just got the Color Explosion Glow Board for christmas and loves it. Crayola always has such great products. This looks great! We're a huge fan of all crayola, as they still make their crayons in the US! Sidewalk Paint Sprayer and chalk. The Color Surge™ Crazy Tips looks like it would be fun for the kids. I love the crayons and the sidewalk chalk. Ahhh, the simple pleasures! My son loves the Twistables Colored Pencils - He uses them everyday! i like the sidewalk paint sprayer. The Color wonder sets are a big hit at my house! And I like them becuae I don't have marker all over the tables when they are done. The Model Magic looks like it allows alot of creativity. Thanks for the giveaway! We want to try the 3d sidewalk chalk. My 7 year old son has been asking for the 3-D crayola wonder for a while!! I like the TaDoodles line, although my youngest already uses crayola twistables regularly to color! I also like the TaDoodles™ Scribble And Sing™ Art Station. I like the 150 ct. Telescoping Crayon Tower. Thanks! Crayola introduced 3D Sidewalk chalk last summer and I always wanted to try that out to see if it worked (my daughter loves to color the driveway). I'd love to also get a glow station for my son...he'd get a real kick out of it. THanks for the giveaway. I would also like the Glow Station! I know my kids would love the Sidewalk Paint Sprayer. I like Pip-Squeaks Washable Markers. I love the Model Magic 14 ct. 0.5-oz. Deluxe Variety Pack. My kids can't get enough of it. They make all kinds of creations. I buy it to keep on hand during hurricane season in case we loss power. I know that it will keep them busy for awhile. My family of girls is all about painting (with the washable kind of paint, thankyouverymuch, Crayola!) ;) So we'd love the Sidewalk paintsprayer!! Crayons are always my favorite but other than those I like the crayola beginnings scribble and sing. Scribble and Sing Art Station looks fun! I like the Crayola Color Explosion Black Disney Pixar Cars set. The Glow Station looks the best! Even I'd like to play! The Crayola Glow Station looks really cool and my kids love their Color Wonder markers. We also like the Glow Station! Thanks! My favorite is the color explosion Glow Board. Color Explosion Extreme Surprises looks fun. Thanks for the giveaway!